Welcome. This blog, Nyheter från ett gammalt hus, or News from an old house, is about the Nordic lands and the USA. My heritage is Swedish so that is my reference point for my Nordic studies. My interest in the Nordic region includes not only Sweden but also Denmark, Norway, Iceland, Finland, Åland, Faroe Islands, and Estonia. I have fewer books about Greenland but of course include this true ice-land in my focus of study. Ja, jag vill leva, jag vill dö i Norden. Thou quiet, thou joyful [and] fair! Thy sun, Thy sky, Thy meadows green. Yes, I want to live I want to die in the North. 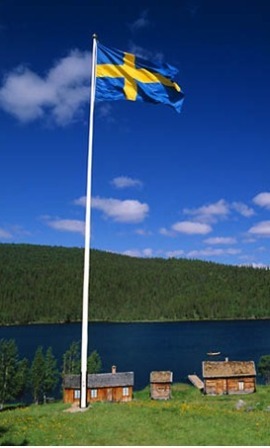 Du gamla, Du fria ( Thou ancient, Thou free ) is the de facto national anthem of Sweden. It was originally named Sång till Norden ( Song to the North ), and the first words of its lyrics have become adopted as the title in the interim. Although the Swedish constitution makes no mention of a national anthem, the song enjoys universal recognition and is used, for example, at sporting events. It first began to win recognition as a patriotic song in the 1890s, and the issue of its status was debated back and forth up until the 1930s. In 1938 Sveriges Radio (SVT) started playing it at the end of transmitting in the evenings, which marked the beginning of the de facto status as national anthem the song has had since. Despite a widespread belief that it was adopted as the national anthem in 1866, no such recognition has ever been officially accorded. A kind of official recognition was when the King Oscar II rose in honour when the song was played, the first time in 1893. In 2000 a Riksdag committee rejected, as unnecessary , a proposal to give the song legally official status. However, there have since been repeated motions with a similar intent. The original lyrics were written by Richard Dybeck in 1844. Swedish composer Edvin Kallstenius arranged the traditional melody from Västmanland. Dybeck himself originally wrote the beginning as Du gamla, Du friska (Thou ancient, Thou hale), but in the late 1850s he changed the lyrics to Du gamla, Du fria (Thou ancient, Thou free). The song was already published in several song books and sung with Du gamla, Du friska , but a priest who had known Dybeck got the opportunity to tell the singer most associated with the song, opera singer Carl Fredrik Lundqvist, about the change in the year 1900. From that point on, printings of the friska version ceased to be seen in song books, but a recording from 1905 where it is sung with friska still exists. By the early 1900s, many regarded the song unsuitable as a national anthem. In the 1890s it started getting printed in song books in the section for patriotic songs, but as late as in the 1920s it was occasionally published just as folk music . In 1899 a contest was held for writing a national anthem. It led to Verner von Heidenstam writing his Sverige , but did not lead to any new national anthem. Patriotic sentiment is notably absent from the text of the original two verses, due to them being written in the spirit of Scandinavism popular at the time (Norden refers to the Nordic countries in Swedish, Norwegian and Danish). After the song started to acquire its informal status as the national anthem, various people wrote additional verses to increase the Swedishness of the song. The aforementioned Lundqvist wrote his own third verse beginning with Jag älskar dig Sverige (I love thee, Sweden), Frans Österblom wrote four verses beginning with Jag älskar min hembygd ( I love my native area ) and Louise Ahlén in 1910 wrote two verses which are occasionally printed still to this day. For a long time, they were very seldom published, and are still largely unknown to the public. A very common mistake is singing Jag vet att Du är och förblir vad du var ( I know that You are and remain what You were ) instead of Jag vet att Du är och Du blir vad du var ( I know that You are and You will be what You were ). It is also a misunderstanding of the original lyrics to sing Ja, jag vill leva, jag vill dö i Norden (Yes, I want to live I want to die in the North) both times. The original lyrics are Ack, jag vill leva, jag vill dö i Norden (Oh, I want to live I want to die in the North) the first time. Instrumental performances tend to be incorrectly performed in one of the following aspects or both: the last line of the melody is often played once first as an introduction, and furthermore, many instrumental recordings are of only one verse. Nej, jag vill leva, jag vill dö i Norden! thy banner, featful ones carry high. for Sweden, the beloved native soil. I trade thee not, for anything in a world. No, I want to live, I want to die in the North. Thou quiet, thou joyful beauty! Your shining sun, your sky, your pastures green. When all around the world your name was honoured. In my own Nordic land, I'll live forever.